The name of this organization shall be The Daily Collegian Alumni Interest Group of The Pennsylvania State University (The Daily Collegian AIG or Collegian AIG). The Daily Collegian AIG will promote The Daily Collegian and The Pennsylvania State University among prospective and current students, alumni, and friends; provide a means for alumni and friends of The Daily Collegian to connect for personal and professional enrichment; and stimulate continued interest in The Daily Collegian experience among all of its graduates. Full Membership in The Daily Collegian AIG is available to individuals who have worked on the staff of The Daily Collegian. All members are strongly encouraged to join the Penn State Alumni Association. Any person who desires to support the continued success and ideals of The Daily Collegian shall be eligible for non-voting affiliate membership. Affiliate members are entitled to all other benefits of membership and may be subject to requirements established by the board. The total number of affiliate members shall not at any time exceed the number of full members. This constitution and bylaws and its amendments must not be in conflict with the constitution of the Penn State Alumni Association or the rules and regulations for Alumni Interest Groups (AIGs) as established by the Executive Board of the Penn State Alumni Council. The Board shall have the power to recommend changes to these Bylaws or adopt new documents. Proposed changes to the Bylaws will be distributed to Board members at least 30 days prior to the vote. Amendments shall be subject to a vote by the general membership and require a popular “YES” of the vote for approval. The business and affairs of the Collegian AIG shall be managed and controlled by the Board of Directors. C. Remove a member of the Board for cause by majority vote. B. The immediate past president of the board if otherwise not a full member. Voting privileges apply only to break ties if not already a full member. C. Three Collegian advisers, who shall not have a vote. A. Any individual wishing to serve on the Board of Directors must be eligible for Full Membership as described in Article I, Section 3. 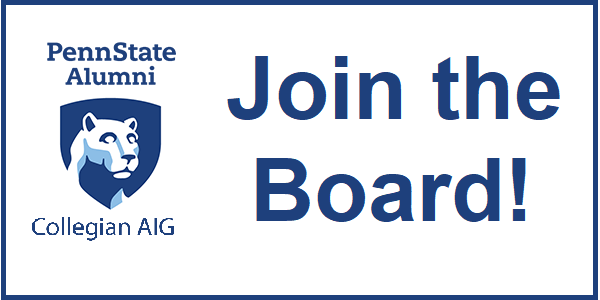 In addition, Board members are required to be members of the Penn State Alumni Association. B. Not more than three members from the same graduating year shall simultaneously serve on the Board of Directors. If the number of candidates in any election could violate this provision, the candidates will be seated according to the number of votes each receives (greatest to least number of votes). After three Board seats are filled in accordance with this section, the remaining candidates from that graduating year will be disqualified from the election. A. Terms commence at the first Board meeting after election results are known. B. All members of the Board of Directors shall serve three-year terms. C. Terms of all officers shall be two years commencing at the first meeting of the Board after election results are known. Board Members may be in consideration for officer positions so long as he or she is not in the final year of their second term or in the final year of their first term and do not plan to be reelected to the Board. D. No voting member of the board shall be elected for more than two consecutive terms. E. The members of the Board shall continue in office until their successors are elected. The President shall assume the office of Immediate Past President if eligible. A. The Board of Directors shall meet by telephone conference, at least on a quarterly basis. B. Based on need, the Board may call special meetings. C. The Board shall hold an annual meeting, which shall be open to all members of the Collegian AIG. At all meetings of the Board, a quorum shall be a majority of able-voting members. A quorum is required to transact all business of the Board. A. Any board member may resign at any time by giving written notice of his or her resignation to the President of the Board of Directors. Any such resignation shall take effect at the time specified therein or, if the time when it shall become effective is not specified therein, immediately upon receipt. Unless otherwise specified therein, the acceptance of any such resignation shall not be necessary to make it effective. B. The President shall appoint an AIG member to fulfill the unexpired term of a board member who resigns or is removed for cause. C. The President may also ask the Nominating Committee for nominations to fulfill any unexpired term. Board members who fail to attend seventy-five percent of work sessions or meetings each year may be dismissed by a majority vote of the remaining Board of Directors and a successor may be appointed as a vacancy to complete the unexpired term. Directors will serve without compensation for their services. The President shall appoint a Nominating Committee of not fewer than three members. The Nominating Committee will prepare a slate of qualified candidates. The Nominating Committee shall determine that members nominated are agreeable to the placing of their names in nomination and will accept office if elected. A. The Nominating Committee shall announce board vacancies by publication on the Collegian AIG website and in the Collegian AIG newsletter 120 days prior to the date of the election. B. The Notice shall include contact information for the Nominating Committee and the deadline for nominations. A. Directors and officers shall be eligible for reelection unless he or she is completing their second term. Reelection is not automatic. If the Nominating Committee deems reelection appropriate, the Committee shall inquire whether sitting directors and officers are willing to be re-nominated prior to advancing their candidacies. B. The Nominating Committee will recruit members willing to be nominated by the Committee. C. Any eligible AIG member interested in serving on the Board of Directors who is not advanced by the Nominating Committee may be self-nominated by forwarding to the Chair of the Nominating Committee, by electronic or regular mail, a resume and statement describing interest of the candidate in serving on the Board of Directors and 20 Collegian AIG member signatures in support of their candidacy. The deadline for self-nominations shall be 30 days prior to the date of the election. D. All candidates must be members of the Penn State Alumni Association. E. The Nominating Committee shall issue a preliminary slate of nominees within 60 days of the deadline for election. The slate shall immediately be announced on the Collegian AIG website. The published announcement of the slate shall include information that individuals not included in the preliminary slate of the Nominating Committee may be nominated by petition and signatures as set forth in paragraph C above. A. As set forth in Article 3, Section 3, the final slate of nominees, which includes statements of qualifications and biographical data, shall be published on the Collegian AIG website no later than 20 days prior to the election. The slate shall be presented in alphabetical order. B. Members shall be elected by popular vote of full members of the AIG prior to the annual meeting with ballots due 10 days prior to the annual meeting. C. The Board shall elect Officers from among current members of the Board at the annual meeting. D. Prior to the annual meeting, the results of the election shall be published on the Collegian AIG website. 4. Perform such other duties as may from time to time be assigned to him or her by the Board of Directors. 5. Act as liaison to the Penn State Alumni Association. 4. Provide direct support to committee chairs. 5. Keep and maintain official records of the group, including membership and committee rosters. 3. Provide a financial report to the Board at each work session. Any officer may be removed for cause (i.e. failure to perform duties, failure to attend meetings, official conduct detrimental to the cause) by a majority vote of the directors during any board meeting provided prior notice of such intent is given to all directors. A. The Board will create and dissolve Committees on an as needed basis depending on the current priorities established in the annual meeting. B. Once established, Committees will create a summary of goals that will be posted on the Collegian AIG website for public consumption. C. Each Committee must include at least one Board member. D. Committees may include non-Board members except in the case of the Executive Committee. A. The Executive Committee is the only permanent standing Committee and cannot be dissolved. B. The Executive Committee will be comprised of the officers of the Board, including the President, Vice President, Secretary, Treasurer, and the immediate past President. The Executive Committee shall: monitor budgets; establish policy; possess and exercise the powers of the Board in the management of the affairs and property of the Collegian AIG during the intervals between Board meetings; and report all of its actions and recommendations to the Board at its next meeting. A. An annual Collegian AIG members meeting shall be held on a weekend at a place determined by the Board. Written notice of the annual meeting shall be published by the Board Secretary on the Collegian AIG website at least 30 days in advance. There shall be at least quarterly Work Sessions of the Board. Special meetings of the Board may be called by or at the request of the President, or by any three directors currently in office.